Diameter 1/4" x 80 feet long. New Rope Tensile Strength 2,200 lbs. Working Load Limit 440 lbs. Tie, Pull, Swing, Climb and Knot. Winches, Dock rigging, Blocking, Flagpole lanyards, Tent guide lines, Clothes lines, Craft/general purpose Tie Down, Boat dock and Mooring lines, Horse halters and reins, Dog Leashes, Art and decorative, Scout knot tying construction, Awning Tie Downs, Ropes Course Construction, Anchor lines, Hammock, Swings, Deck/Dock railings, Golf courses, Crowd control, Water and Snow Ski Ropes, Pool safety & decoration Rope, Decorative Knot Work, Guy Rope, Pet toys, Extremely Long Lasting Synthetic Cabling, Truck cargo Tie down, Electrical Underground Pulling Line, Guy Lines pulling, Halyards, Slings , Knot Tying Classes, Equine Use, Exercise Rope (battle rope, undulation), or simple household applications. There's not a general use for rope where braid Polypropylene won't fit the bill. You have found your source for the highest quality pulling rope, Go ahead and give me a pull! Ram-Pro quarter inch all-purpose Durable light weight Diamond Braid Polypropylene Flagline Rope 80 feet long. Is a must-have item for every home, farm, car, truck, marine, canoe, well, flagpole, backpack, & gear collection. It is heavy industry duty, made of tough Polypropylene & capable of withstanding damage from the weather, with great resistance to chemical exposures like petroleum, rot & mildew. The rope is a clean white color that will not detract from the colors of your high-flying Flag. Ram-Pro Polypropylene Rope is especially treated to resist sun damaging effects of UV rays. Despite the fact that water can weaken the strength of Polypropylene, this effect is so slight that Polypropylene is still commonly used for mooring lines & anchor lines. In fact, this rope is a great choice for any tie-down because of its no loss of strength even when wet, low stretch, & sustenance in any environment. The all-around durability of the rope makes it useful for any job in any situation. 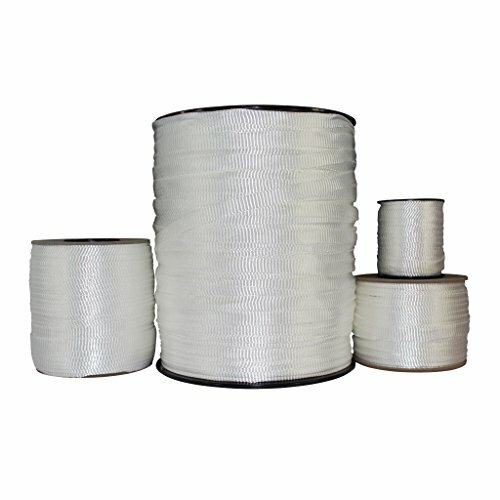 Braid, also known as braid on braid or Yacht Braid rope, is constructed from a Polypropylene core surrounded by a braided soft Polypropylene cover where each alternate loop is twisted in the opposite direction which results in a 100% rope with high strength and good shock absorption Characteristics. This torsion-balanced construction prevents hockling & maintains dimensional stability. This braid is a high strength rope that has a smooth soft feel making for easy handling & Eye splicing. 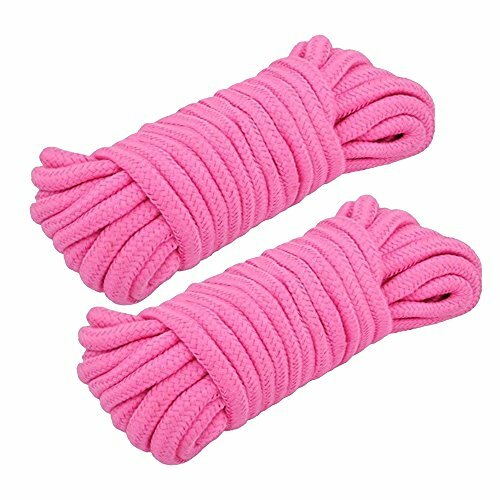 Great to use as a lightweight, high-quality, feel fast jump rope for pre-cardio, crossfit, boxing mma or wrestling worm up. Get ready to rock a super-fast rope routine. Marvel at the smooth, effortless rotation of the cable. Results Weight loss, Cardiovascular & lymphatic health, Muscle tone, Full body workout, Variety of routines & tricks to master, Great for travel or when you lack access to a gym, Burn lots of calories in little time. Have in your hands a rope designed for intense workouts. 65 Feet in total,it is long enough for use. Work Great for cat scratch post. Use the rope on nice gift box and wrap presents. Use it to wrap cattle horns for wall decor. Rope Length: 20 M/65 Feet.Rope Diameter:5mm Thickness. Jute Rope Works Great in Packing,Bundling,Arts and Crafts Projects. Strong and sturdy Jute rope,Protecting Stair Handrail,Water Pipe,Balcony Guardrail. 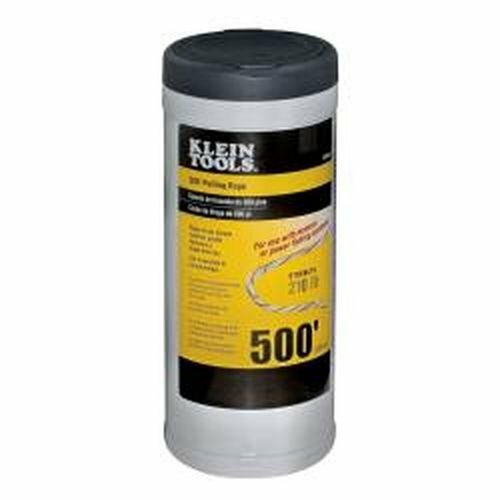 Use the Klein Tools 500-Foot (152.4 m) Pulling Line with manual or power fishing systems in pulling light-duty cables or rope pulling applications. The line comes in a compact container that easily dispenses without tangles and snags. This pull line features a 210 pound (95.3 kg) average breaking strength. Use polypropylene line with manual or power fishing systems for light duty cable or rope pulling applications. Ready to use storage containers quickly dispense a tangle free, knotless line and also protect line from direct sunlight. Line is resistant to rot and mildew. For more than 160 years, Klein Tools has manufactured premium-quality, professional-grade hand tools that deliver the performance, durability and precision needed to get the job done right. Our family of engineers, workers and craftsman continue to put six generations of expertise into every tool we create by using only the highest quality materials, superior workmanship, and keeping manufacturing as close to home as we can. Klein isn't just the name of our company, it's also our family name. And since we're an American company that's family-owned and family-run, you know you can count on us to be here tomorrow. Klein Tools doesn't just make great products, we make great products that stand up to the demands of the professionals who use them every day ... Since 1857. 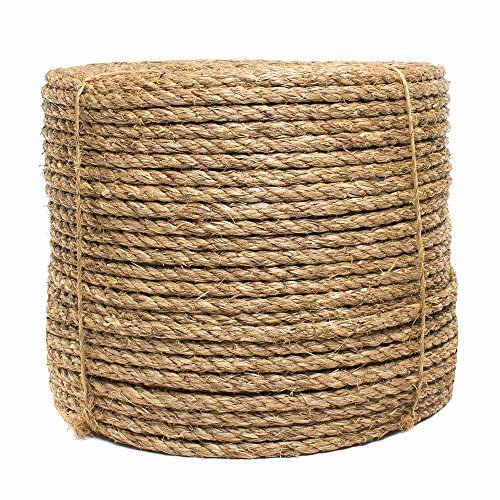 TWISTED MANILA ROPE - Strong and rustic all natural three strand manila rope made for landscaping, gardening, and general outdoor use. Durable enough for heavy-duty projects. 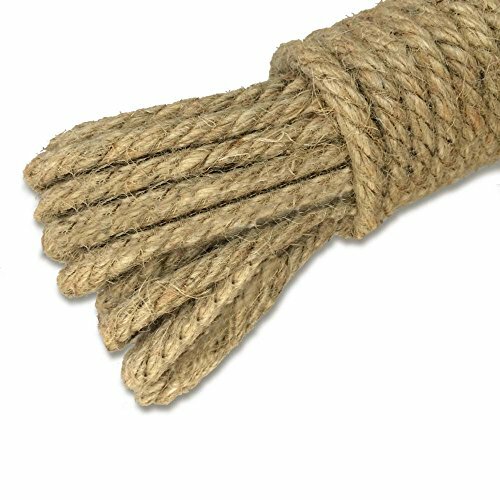 If you have indoor crafting needs, check out our Twisted Jute Rope, a product we carry for indoor crafters who want a twisted, natural rope! ALL WEATHER USE - 100% natural manila hemp fibers are treated with a special oil to increase natural resistance to moisture and weather. Threads remain strong in rain, wind, sun, and snow. The natural rope of choice for outdoor applications. 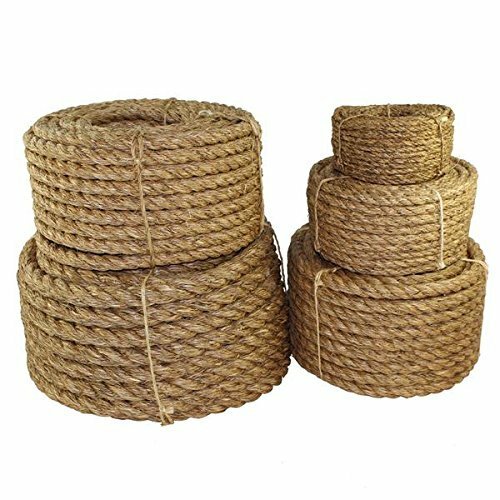 ONE STOP SHOP - Super versatile manila rope is perfect for any project: crafting, camping, hunting, construction, carpentry, freshwater and saltwater boating, fishing, and hundreds of other activities. LENGTH and WIDTH - Choose between pre-cut lengths of 10 feet, 25 feet, 50 feet, 100 feet, or 600 feet. Manilla Rope diameter thickness options: 1/4 inch, 5/16 inch, 3/8 inch, 1/2 inch, 5/8 inch, 3/4 inch, 1 inch, 1.25 inch, 1.5 inch, 2 inch, or 3 inch. VETERAN OWNED and OPERATED - Just like the Marine Corps, SGT KNOTS is committed to being the best of the best. We continue to live by the motto, Semper Fidelis Always Faithful. Our loyalty to our customers is what makes us who we are, and the reason we continue to grow in popularity and product offerings. We promise to maintain the strength and consistency of our products. We also pass down our bulk savings to our customers. Heavy duty nylon withstands weather damage and sun exposure. 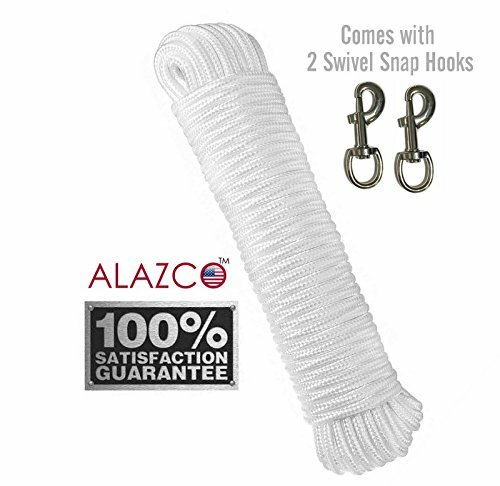 Tighten and secure your items with the Redneck Convent Nylon Braided Rope & Carabiner 3/8" Inch x 50' Feet 220 lbs Pound - Cleat Tensioner Rigging Device Tie Down Strap Anchor. You can use it as a hoist or pulley, while camping or hiking, during roadside emergencies, and even as a backyard dog leash or for towing small engine vehicles. The dark green nylon braided rope has a 220-pound working load limit and is UV, rot, and mildew resistant and absorbs shock. The included carabiner clip makes for easy attachment and detachment to any fixed anchor point for hoisting a bow/gun or backpack together. It is oversized for easy use even when wearing gloves or when you have your hands full. The other end of the rope is heat-sealed to prevent unraveling. Not for climbing. WARNING: This product can expose you to chemicals which is [are] known to the State of California to cause cancer and birth defects or other reproductive harm. For more information go to www.P65Warnings.ca.gov. West Coast Paracord 1/4-inch, all-natural sisal rope is the perfect rope for cat posts as well as other types of animal toys. Made from the fibers of the Agave sisalana in a manufacturing process that involves no chemicals, oils, or other treatments. When using this for cat scratching posts, you can use heavy duty staples to secure the rope or some heavy-duty glue or hot glue would work as well. If you want to use this for other projects you can do that too, from wall hangings, tie-downs, decorations around your house and much more. Our sisal rope is strong and durable with a little flexibility, so you can use it for many different things. This is 100 feet of 1/4-inch sisal rope. Have a wiring or fiber optic project coming up? Need a low-profile tie-down to secure some delicate cargo? Find yourself with another need for high-strength yet narrow polyester webbing? SGT KNOTS Polyester Pull Tape / Mule Webbing is up to whatever task you dream up for it, and comes at a price that's right for any project, no matter what the budget. SGT KNOTS Polyester Pull Tape is designed to glide easily even through narrow conduit, making it easy to pull electrical wire, phone wires, fiber optic cables, and other lines up, down, or sideways. It's high-strength, low-stretch, low-friction design also makes it suitable for a range of other purposes, including as cargo tie-downs for smaller and more fragile loads, crafting projects, and more. Rugged and reliable without roughing up or marring the surfaces it touches, this polyester webbing is durable with a delicate touch. 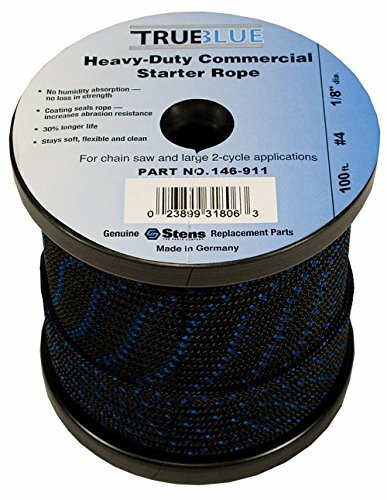 5/8" in width and available on easy-to-deploy plastic spools in lengths of 100, 300, 500, and 3000 feet, SGT KNOTS Polyester mule webbing is as flexible in its uses as it is on the spool. White and undyed, it won't leave markings on walls or anywhere else it's used. 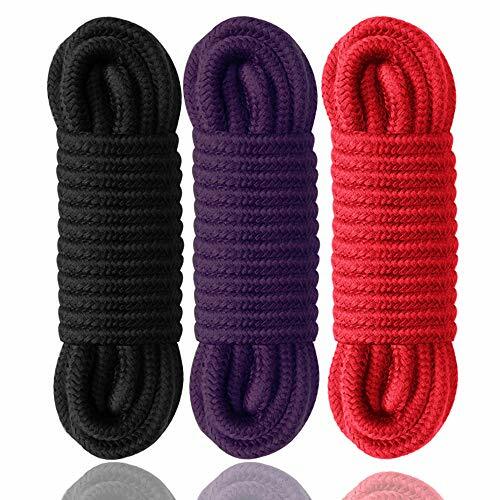 Made in the USA and, as with all products sold by SGT KNOTS-proud to be a veteran-owned company-this poly pull tape / polyester webbing is 100%-backed by the SGT KNOTS guarantee. POLYESTER PULL TAPE - A lightweight pull tape for easy cabling and wiring on your next electrical project. Our pull webbing is designed to work on small DIY home office jobs and large commercial plans. Compatible with all varieties of cable: network, power, fiber optics, audio, general use, and more! POLYESTER STRENGTH - Our mule webbing is made of 100% polyester fiber for a high strength, low stretch, and low friction performance. Easy to maneuver through tight, hard to reach electrical ducts and conduits. SGT KNOTS synthetic versatile flat tape can also be used for cargo straps, gear tie-down, crafting projects, and more. HIGH RESISTANCES - Polyester is one of the most popular rope, cord, twine, tape, and webbing materials on the market. Poly fibers are equipped to handle high stress, high pressure environments like construction sites and factories. With built in resistance to moisture, sunlight/UV rays, temperature, and most weather. LENGTH and WIDTH - Choose between pre-cut lengths 100 feet, 300 feet, 500 feet, or 3,000 feet. SGT KNOTS Printed Pull Tape diameter thickness is 5/8 inch. Available in white. VETERAN OWNED and OPERATED - Printed Pull Tape made in the USA. Just like the Marine Corps, SGT KNOTS is committed to being the best of the best. We continue to live by the motto, Semper Fidelis-Always Faithful. Our loyalty to our customers is what makes us who we are, and the reason we continue to grow in popularity and product offerings. We promise to maintain the strength and consistency of our products. We also pass down our bulk savings to our customers. 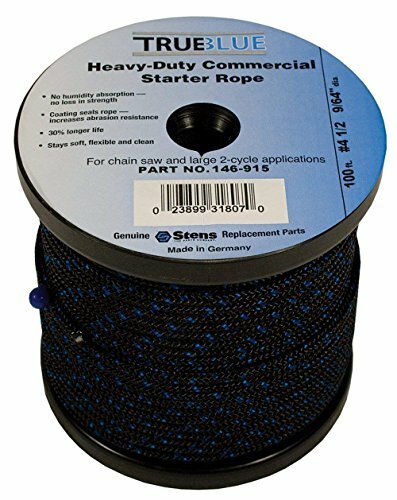 Stens 146-915 100' true blue starter rope #4 1/2 solid braid diameter: 9/64 " length: 100 ' heavy-duty commercial solid braid. 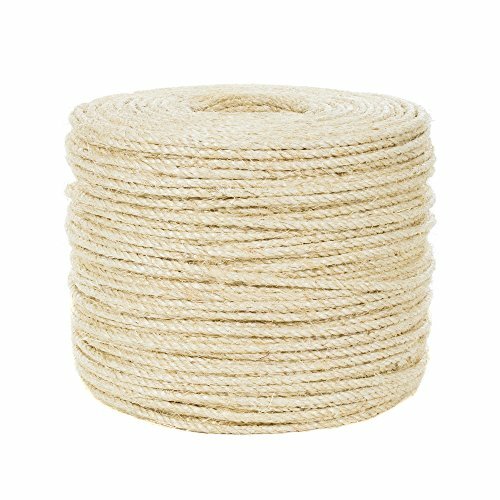 West Coast Paracord Twisted Premium 3 Strand Natural Fiber Manila rope is a great utility rope thats durable and versatile making it a good choice for any heavy-duty project and ornamental alike. The rope is improved with mineral oil to withstand any type of weather. 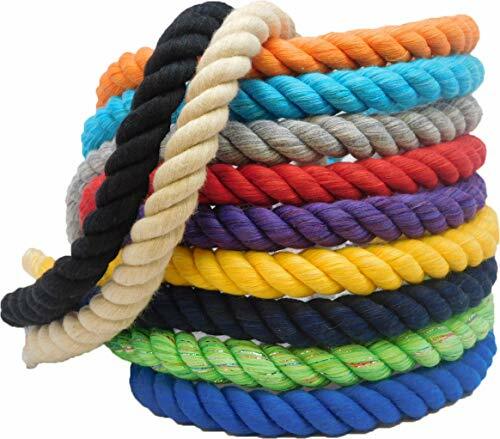 West Coast Paracords Twisted Manila Hemp Rope works excellent for nautical, landscaping, or other utility uses due to the high tensile strength and sustainability through salt water and hot wires. This is a 50-ft length of 1/2-inch diameter manila rope. When wet manila rope can shrink in length and expand in size. 1/2" - 12.7mm - 2385 lbs. - 424 lbs. This is 5/8" by 100 feet of brand new double braided polyester rope. Excellent rope for arborist tree work. White with orange tracers. About 12,000 pounds tensile strength. Made in the USA. Premium grade Golberg 3 Strand Natural Fiber Manila Rope is the strongest of all natural fiber ropes. This versatile rope is tough in strength and sturdy with a vintage look making it great for any heavy-duty project and ornamental alike. Golberg's manila rope works great for hauling, landscaping, towing, safety line, climbing, fence rails along pathways, handcrafted bags, carpets, clothing, furniture, and hangings. Decorative and functional, manila rope is resistant to salt water damage giving it multiple nautical applications as well such as hawsers, ship lines, and fishing nets. Manila rope, commonly referred to as "hemp rope", is a flexible and durable rope that has maintained its popular reputation through the years. Made from the leaves of the abaca plant, this natural rope comes improved with mineral oil made to withstand any weather. Unlike synthetic rope, manila rope does not melt when coming in contact with hot wires, making it the choice rope for contractors working around live wires. This environmentally friendly high-strength rope is timeless making it your best option for any project! 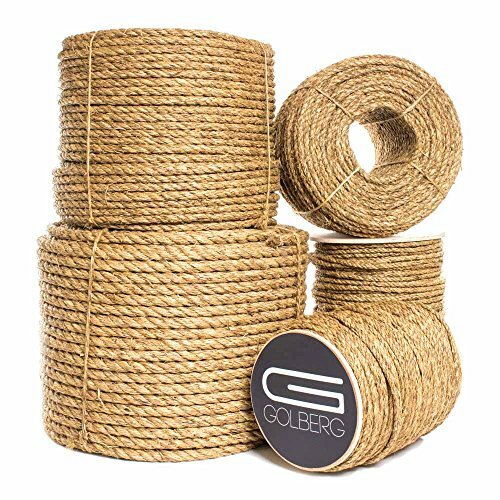 GOLBERG 3 Strand Natural Fiber Manila Rope comes in a variety of length and width options coming in 10 feet, 25 feet, 50 feet, 100, feet or 600 feet X 1/4 inch, 5/16 inch, 3/8 inch, 1/2 inch, 5/8 inch, 3/4 inch, 1 inch or 2 inch. Golberg is a premium brand that delivers quality products at affordable prices made from the best materials. 1/4" - 6.3 mm - 540 lbs. 5/16" - 7.9 mm - 900 lbs. 3/8" - 9.5 mm - 1,215 lbs. 1/2" - 12.7 mm - 2,385 lbs. 5/8" - 15.8 mm - 3,960 lbs. 3/4" - 19 mm - 4,860 lbs. 1" - 25.4 mm - 8,100 lbs. 1.25" - 31.7 mm - 12,150 lbs. 1.5" - 38.1 mm - 16,650 lbs. 2" - 50.8 mm - 27,900 lbs. Solid Braid nylon a is great all purpose rope. Nylon is a rot and mildew resistant, strong, durable and UV resistant. 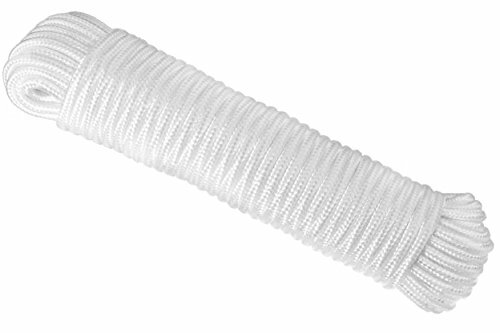 Solid braid nylon will not unravel when cut compared to twisted rope. There are limited used for solid braid nylon such as flagpoles, clotheslines, starter cords, crafts, tie downs, etc. Brand: T.W . Evans Cordage Co. | Manufacturer: T.W . Evans Cordage Co. 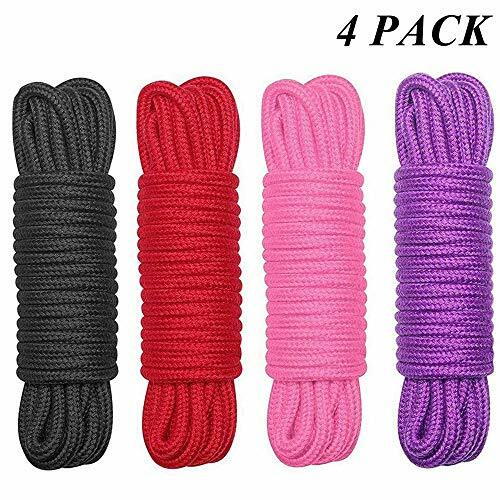 Pack:32 feet 10m per rope,64 feet(20m ) in one pack.Diameter: Approx 1/3inches (8mm). 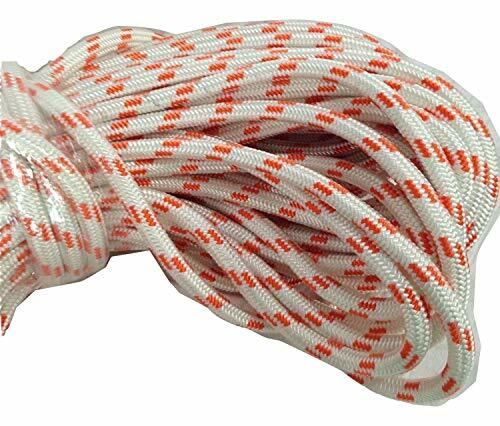 Functional:This cotton rope can be used for camping,wedding ropes, tying luggage, DIY dog/cat rope toys,sewing, craft projects, workcraft projects,and wrapping. Made of soft cotton very durable and firm,washing machine safe. Very strong but also very soft and lightweight,For example,hanging clothes, binding package, sewing. Notice:If you have any questions,please contact us at any time. What makes a good rope? Friendly material: Soft and comfortable, doesn't irritate your skin or fade like many others. Not slippery: The rope can be tied tightly and also has a little bit of stretch to it. Holds a knot well when tied nicely. Durable: Woven from soft, pliable cotton, very durable and firm. Twisted Nylon Rope 1/4 Inch x 50 ft (pack of 2 for a total of 100 feet of nylon rope). 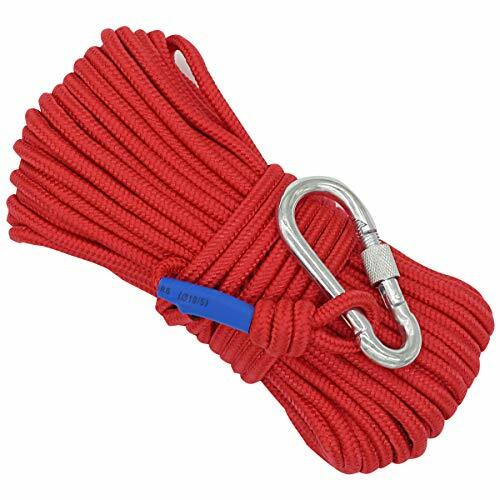 This is general all purpose easy to grip all purpose rope used for securing various water crafts such as boats, securing cargo either in a truck bed or on top of a luggage rack, securing furniture during moves. Works great with pulleys for moving heavy objects. 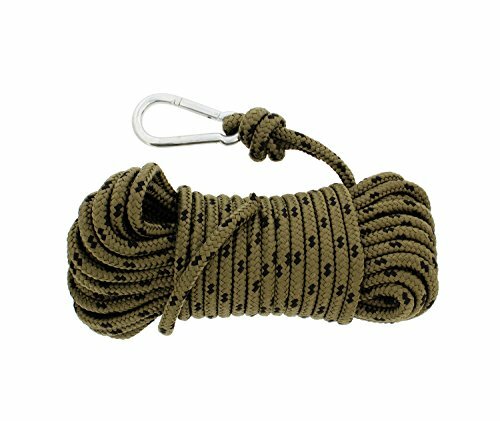 Twisted Nylon Rope - General, all-purpose rope. Easy to grip and splice. Shock absorbent. Recommended for securing boats, cargo and furniture. Strong, abrasion resistant. Flexible, easy to knot. Won't rot or mildew. 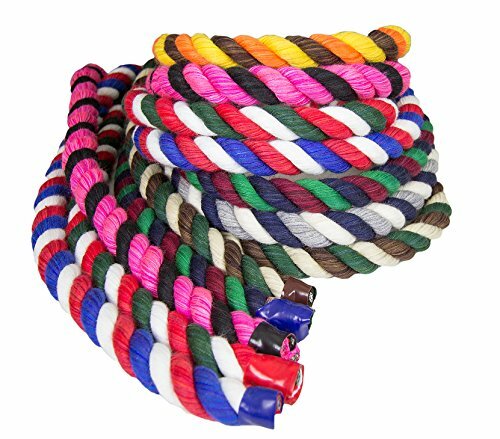 Beautiful Vibrant Colors - Create Your Own Custom Rope! 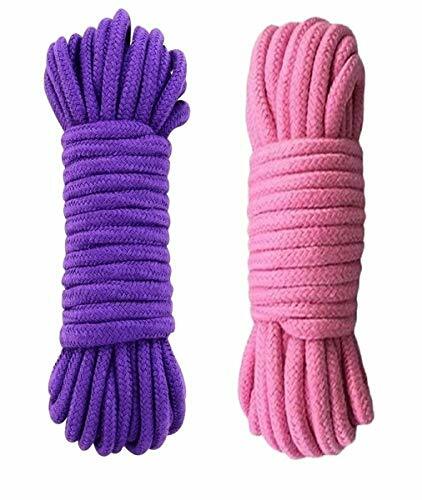 This versatile cotton rope set is offering plenty of length, so you can get many good wraps and ties The ropes are thick enough to hold a tight grip and not tear under pressure, yet thin enough to prevent having bulky knots. Winches, Dock rigging, Blocking, Flagpole lanyards, Tent guide lines, Clothes lines, Craft/general purpose Tie Down, Boat dock and Mooring lines, Horse halters and reins, Dog Leashes, Art and decorative, Scout knot tying construction, Awning Tie Downs, Ropes Course Construction, Anchor lines, Hammock, Swings, Deck/Dock railings, Golf courses, Crowd control, Water and Snow Ski Ropes, Pool safety & decoration Rope, Decorative Knot Work, Guy Rope, Pet toys, Extremely Long Lasting Synthetic Cabling, Truck cargo Tie down, Electrical Underground Pulling Line, Guy Lines pulling, Halyards, Slings , Knot Tying Classes, Equine Use, Exercise Rope (battle rope, undulation), or simple household braided applications. We love our product and believe you will love it too! If for whatever reason you don't, Yezala is backed by our 100% money back guarantee. 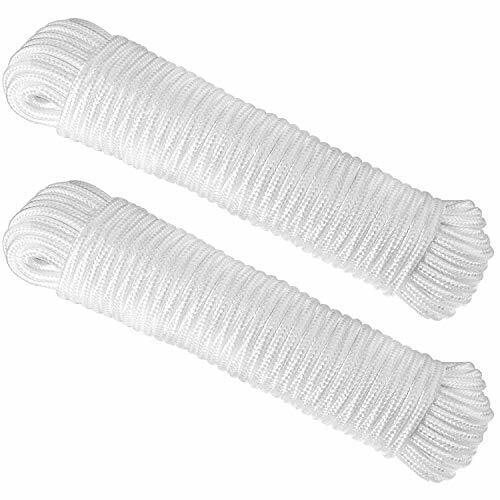 You deserve to have these super high quality all purpose soft cotton ropes. Click "Add to Cart" and order yours today! Length: 32 feet (10m) per rope, 64 feet in one pack! Diameter: 1/3inches (8mm). Super long length gives you lots of freedom for most "situations".